One of the most popular uses for CoQ10 is to support patients taking medications aimed at normalizing lipid profiles. These medications may interfere with endogenous production of CoQ10, creating a drug-nutrient depletion (practitioners can check for any potential drug interactions here. )3 Results of human clinical trials are mixed, but some studies suggest that supplementation can support healthy levels of CoQ10 and support healthy mitochondrial function in patients taking medications for lipid metabolism. *4 The dosages used in these studies ranged from 100 to 240 mg/day. The benefits of CoQ10 may be less widely used for neurological and muscular support,* but studies addressing these body systems show promise. A randomized controlled trial in 80 subjects found CoQ10 to support neurological and muscular function over the course of 16 months. *9 Three dosages were evaluated in this study (300, 600, and 1200 mg/day), and only the highest dosage of CoQ10 produced a statistically significant effect in comparison with placebo. Learn more about CoQ10 and Mitochondrial Function. Sarah Cook is a freelance medical writer in Westminster, CO. She has a certificate in biomedical writing from the University of the Sciences in Philadelphia, PA and a naturopathic doctorate from the Southwest College of Naturopathic Medicine in Tempe, AZ. She has previous experience in clinical practice, supplement sales, and academics. In addition to writing, she is currently a faculty member at the Nutrition Therapy Institute in Denver, CO.
1. Crane FL. Biochemical functions of coenzyme Q10. J Am Coll Nutr. 2001;20(6):591-598. 2. Littarru GP, Tiano L. Bioenergetic and antioxidant properties of coenzyme Q10: recent developments. Mol Biotechnol. 2007;37(1):31-37. 3. Mohammadi-Bardbori A, Najibi A, Amirzadegan N, et al. Coenzyme Q10 remarkably improves the bio-energetic function of rat liver mitochondria treated with statins. Eur J Pharmacol. 2015;762270-274. 4. Apostolopoulou M, Corsini A, Roden M. The role of mitochondria ... Eur J Clin Invest. 2015;45(7):745-754. 5. Sharma A, Fonarow GC, Butler J, Ezekowitz JA, Felker GM. Coenzyme Q10 and ..: A State-of-the-Art Review. Circ Heart Fail. 2016;9(4):e002639. 6. Mortensen SA, Rosenfeldt F, Kumar A, et al. The effect of coenzyme Q10 on morbidity and mortality in …: results from Q-SYMBIO: a randomized double-blind trial. JACC Heart Fail. 2014;2(6):641-649. 7. de Frutos F, Gea A, Hernandez-Estefania R, Rabago G. Prophylactic treatment with coenzyme Q10 in patients undergoing …: could an antioxidant reduce complications? A systematic review and meta-analysis. Interact Cardiovasc Thorac Surg. 2015;20(2):254-259. 8. Tsai KL, Huang YH, Kao CL, et al. 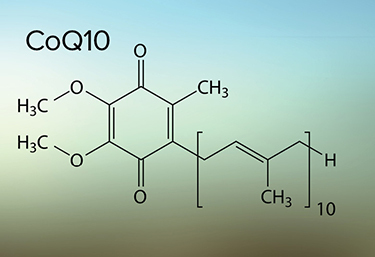 A novel mechanism of coenzyme Q10 protects against human endothelial cells from oxidative stress-induced injury by modulating NO-related pathways. J Nutr Biochem. 2012;23(5):458-468. 9. Shults CW, Oakes D, Kieburtz K, et al. Effects of coenzyme Q10 in early …: evidence of slowing of the functional decline. Arch Neurol. 2002;59(10):1541-1550. 10. Cordero MD, Cano-García FJ, Alcocer-Gómez E, De Miguel M, Sánchez-Alcázar JA. Oxidative stress correlates with …: coenzyme Q10 effect on clinical improvement. PLoS One. 2012;7(4):e35677. 11. Cordero MD, Alcocer-Gómez E, de Miguel M, et al. Can coenzyme Q10 improve clinical and molecular parameters in …. Antioxid Redox Signal. 2013;19(12):1356-1361. 12. Miyamae T, Seki M, Naga T, et al. Increased oxidative stress and coenzyme Q10 deficiency in juvenile …: amelioration of … by ubiquinol-10 supplementation. Redox Rep. 2013;18(1):12-19. 13. Kolahdouz Mohammadi R, Hosseinzadeh-Attar MJ, Eshraghian MR, Nakhjavani M, Khorami E, Esteghamati A. The effect of coenzyme Q10 supplementation on metabolic status of type 2 diabetic… patients. Minerva Gastroenterol Dietol. 2013;59(2):231-236. 14. Rozen TD, Oshinsky ML, Gebeline CA, et al. Open label trial of coenzyme Q10 as a migraine preventive…. Cephalalgia. 2002;22(2):137-141. 15. Lockwood K, Moesgaard S, Folkers K. Partial and complete regression of breast cancer… in patients in relation to dosage of coenzyme Q10. Biochem Biophys Res Commun. 1994;199(3):1504-1508. 16. Sakata T, Furuya R, Shimazu T, Odamaki M, Ohkawa S, Kumagai H. Coenzyme Q10 administration suppresses both oxidative and antioxidative markers in hemodialysis .. patients. Blood Purif. 2008;26(4):371-378.